…Sabal Trail has agreed to install two side-taps on its Mainline Facilities to support and facilitate future growth and natural gas utilization for the member cities of the Municipal Gas Authority of Georgia (“MGAG”). MGAG is the largest non-profit natural gas joint action agency in the United States, serving 78 members in Georgia, Alabama, Florida, Pennsylvania and Tennessee. MGAG currently has seven member cities within 15 miles of Sabal Trail’s proposed pipeline route in southwest Georgia and has identified Dougherty and Colquitt Counties as having the greatest potential to need additional gas supplies in the future. Sabal Trail will install a side-tap on its system in each of these counties to help facilitate future interconnections. The installation of side-taps during the initial construction of the Sabal Trail Project will facilitate MGAG’s access to gas supplies without interruption to transportation services provided to the existing shippers. The exact locations of the side-taps have not yet been identified and Sabal Trail will provide that information when determined. The Municipal Gas Authority of Georgia (the Gas Authority) is the largest non-profit natural gas joint action agency in the United States, serving 77 Members in Georgia, Alabama, Florida, Pennsylvania and Tennessee who meet the gas needs of approximately 250,000 customers. 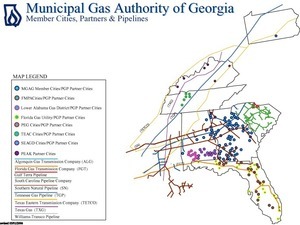 The Gas Authority was formed in 1987 by an Act of the Georgia General Assembly to assist Municipal Members who own and operate natural gas distribution systems. Members’ systems are located on three interstate pipelines: Southern Natural Gas Company (Southern Natural), Transcontinental Gas Pipeline Company, LLC. and Texas Eastern (TETCO). Well well! Transcontinental Gas Pipeline Company, LLC is the very same Williams Transco of the Hillabee Expansion Project (FERC docket CP15-16) from which Sabal Trail wants to get its fracked methane. And Texas Eastern (TETCO) is the notorious PCB-spilling apartment-exploding subsidiary of Spectra Energy. Meanwhile, Southern Natural Gas Company (Southern Natural) is the same SONAT that has filed with FERC about the needless risk of the Sabal Trail pipeline. I wonder if Sabal Trail or MGAG bothered to ask SONAT before they made this eminent-domain-enabling deal? After my blogged question, “Have Dougherty and Colquitt County sold us out to Sabal Trail?” SpectraBusters in Dougherty and Colquitt County have been busy asking county commissioners and city councillors who approved this deal, thus far with no confirmation whatever that any of them even knew about it. The City of Moultrie owns its own natural gas distribution system and purchases gas wholesale from the Municipal Gas Authority of Georgia (MGAG). The city offers gas coverage within the incorporated areas of the City of Moultrie and would be the gas service provider for the Traylor sites. And that Members page does have sub-pages for each of Southern Natural Pipeline, which does list Moultrie but not Albany, for TRANSCONTINENTAL GAS PIPE LINE COMPANY, LLC., and for TETCO. Actually, Albany isn’t listed on any of those sub-pages, and I don’t recognize any of the cities named in those pages (other than Moultrie) as being in Colquitt County or Dougherty County. Some of the other cities, such as Thomasville, may now be paying attention to Sabal Trail when they weren’t before. Well, it turns out I was right. They have contacted NOBODY in either counties governments, city or county, about this wonderful thing they had done—to approve side-taps for all the growth these two counties are going to experience in the future (I then informed him of the shrinkage in Colquitt County’s last census numbers and the fact that while Colquitt County is the #1 agricultural county in the state, there is NO growth in sight. That coupled with the fact that the only natural gas lines are in the city of Moultrie would actually make his decision to place a side-tap for us very suspect). As you can see by this historical population graph, Colquitt County isn’t growing much if at all, and Dougherty County has been losing population since the 1980s. Say again, Sabal Trail, how does losing population make these two counties the ones “having the greatest potential to need additional gas supplies in the future”? The only big county around here that is growing much is Lowndes County. Everybody in south Georgia knows that, but apparently Sabal Trail didn’t bother to find out or is “not familiar” with the largest county on the entire proposed pipeline path in Georgia. And neither Lowndes County nor its county seat the City of Valdosta are MGAG customers. That is right—all this is a FABRICATION of Spectra’s doing!!! I need your help contacting him, his office, and the board of directors and educating them about this pipeline. I did send him Region 4 EPA’s report last night so he could read about their suggested reroutes and learn about “karst” soil. Please let him know your position and ask him to rescind his endorsement as I did last night. By the way he had no response when I asked him how we could get this done. But, YOU ALL know how to do it!!! Contact EVERYBODY about this latest attempt to establish need when there is NONE!!! You may also want to contact your city, county, and state elected and appointed officials. I have been waiting on this move by Sabal Trail/Spectra Energy and here it is. They are hell bent on getting this gas exported through sink hole prone Florida via sinkhole prone South Georgia. we sure need to get busy contacting MGAG! This is irritating to the max that Sabal Trail is trying with everything they have to get this dangereous pipeline coming through our state and that our own representitives succomb to their every want.